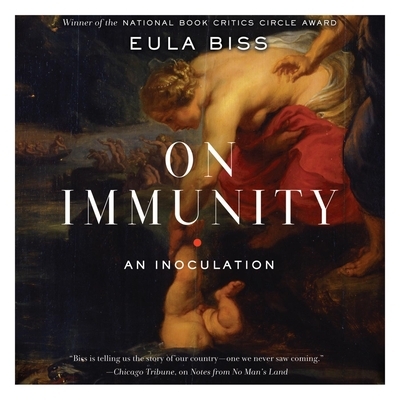 Upon becoming a new mother, Eula Biss addresses a chronic condition of fear—fear of the government, the medical establishment, and what is in your child’s air, food, mattress, medicine, and vaccines. She finds that you cannot immunize your child, or yourself, from the world. In this bold, fascinating book, Biss investigates the metaphors and myths surrounding our conception of immunity and its implications for the individual and the social body. As she hears more and more fears about vaccines, Biss researches what they mean for her own child, her immediate community, America, and the world, both historically and in the present moment. She extends a conversation with other mothers to meditations on Voltaire’s Candide, Bram Stoker’s Dracula, Rachel Carson’s Silent Spring, Susan Sontag’s AIDS and Its Metaphors, and beyond. On Immunity is a moving account of how we are all interconnected—our bodies and our fates. EULA BISS is the author of Notes from No Man’s Land, winner of the National Book Critics Circle Award for criticism, and The Balloonists. Her essays have appeared in the Believer and Harper’s Magazine. She teaches at Northwestern University and lives in Chicago, Illinois. TAMARA MARSTON has been an actor, singer and director for over 30 years. A career performer / musician, Tami has toured nationally with several groups and appeared on The Arsenio Hall Show and A&E’s Goodtime Café. Dividing her time between acting and singing gigs, choral conducting, music and stage directing, jingle and voiceover work, private and public teaching—and family—Tami feels very fortunate to make her living working in the arts.